1 Billion years in the future, the Earth is a truly unfamiliar place. A hodgepodge of strange creatures, bizarre devices, and relics of past civilizations. It is a beautiful and cruel world in equal measure. In this land of wonders, four people will begin a journey that, by its end, may shake the planet to the very core. 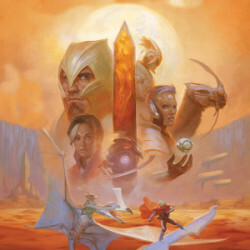 A Numenera Actual Play.